It has been ages since I added anything new to my blog, mainly because I have been doing promotional work for my first book, The Wing Warrior, and rolling out my second book, The Unicorn Rider. But now that's all out of the way, it's time to get some reviews posted. I thought I'd start with something that isn't out of print: Ramses Pyramid. Of course, I really enjoy board games - if I didn't, I wouldn't have this blog and a spare room stacked with more board games than furniture - but I am also a fan of Lego. I don't allow myself to buy Lego, because I don't have enough room for another collection of toys; but Lego board games allow me to make an exception from time to time. You see, a Lego board game gets to be classed as part of my game collection while also giving me just enough of a Lego fix to prevent me from rushing off to the toy store and buying that pretty awesome The Lord of the Rings Mines of Moria Lego set. Unfortunately, there is one problem: Lego is awesome, board games are awesome; but when they are combined, the results seem to be... well... not awesome. The sets tend to be rather uninteresting to build (as they need to be functional and often repetitive designs) and the games tend to be rather simplistic as they are designed for younger players and "non-gamer" families. 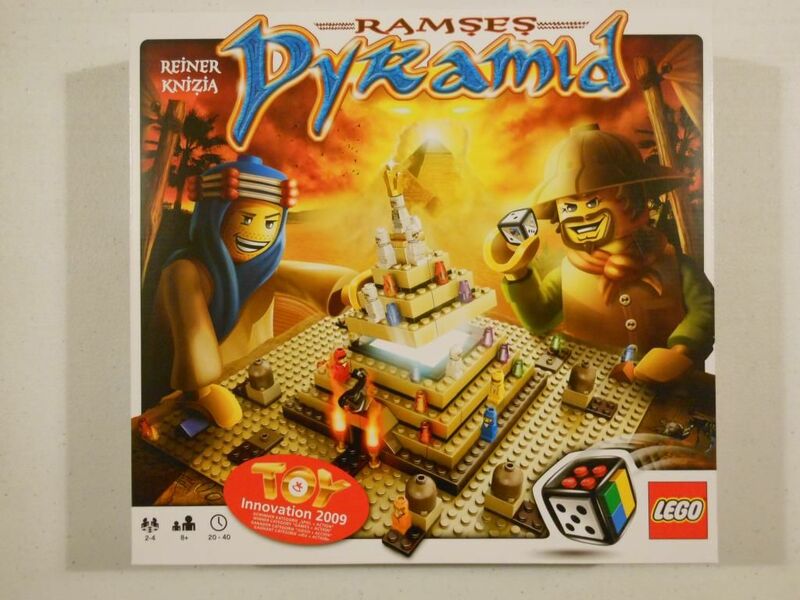 Such is the case with Ramses Pyramid, a game that has Reiner Knizia's name on the box but little other evidence that he participated in the game's design. The box - proudly displaying the Toy Innovation 2009 logo. When I review a game, I usually start by talking about the quality of the pieces. That isn't really necessary here: We're talking about Lego, and that means the quality of the pieces is exceptional. 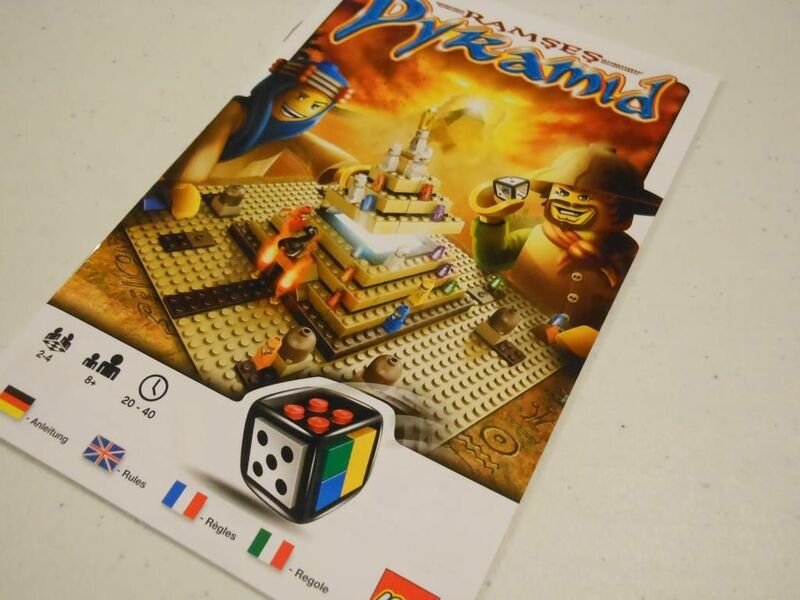 You get enough Lego blocks to build a three-dimensional pyramid, a "buildable" dice which has cool rubbery edges so it bounces all over the place, and a bunch of microfigs (four player pieces, and a set of mummies, including the titular Mummy King, Ramses). And in case you don't know what microfigs are - they are basically little Lego characters about the size of a thumbnail. 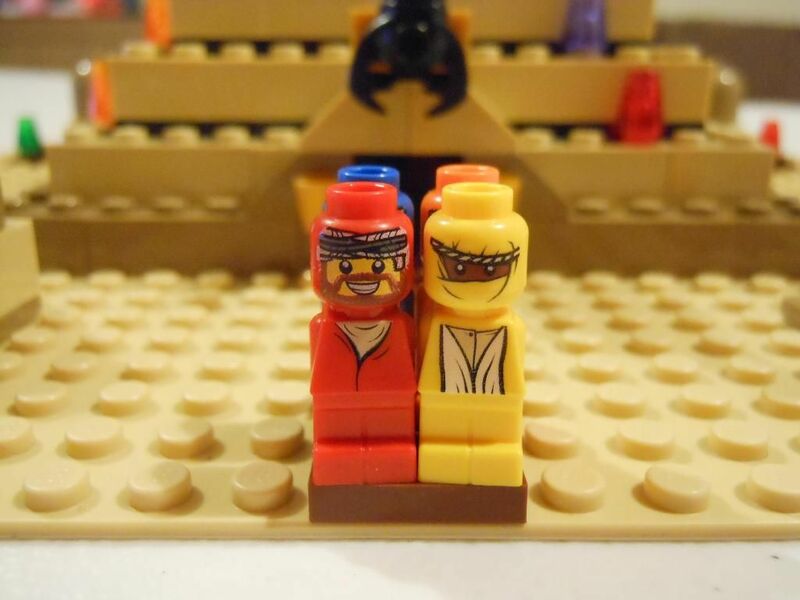 Microfigures - cute, aren't they? Lego collectors will probably be interested to know that this box contains 217 pieces and 13 microfigs. 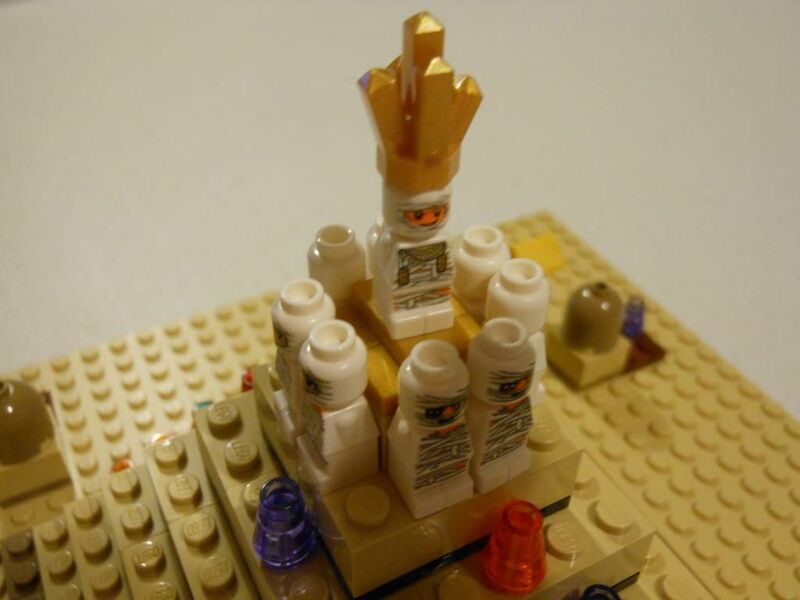 I suppose that even if you don't like the game that much, the pieces (which include some nice "gold" statues, chalices, and different coloured crystals) could easily be used in other builds. The game, built and ready to play. 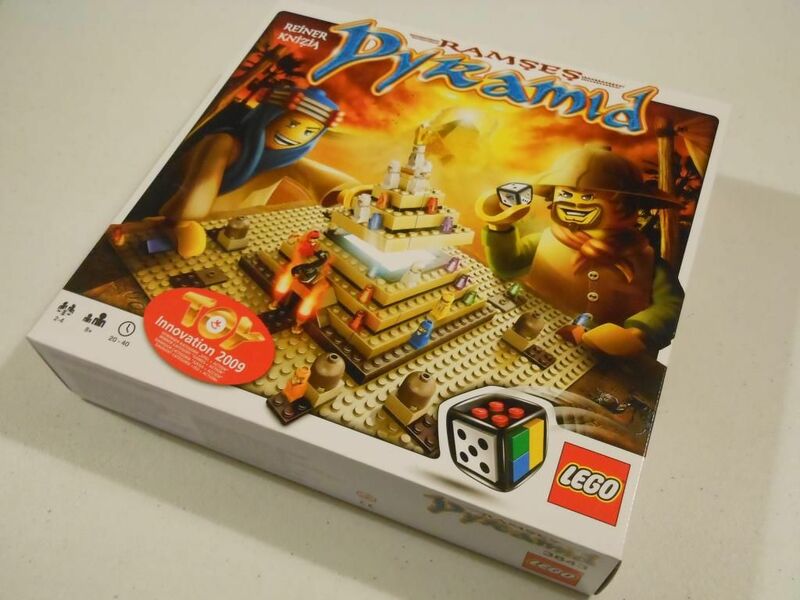 Once you have built the pyramid (which is designed to fit in the box assembled so you only have to build it once! ), you can start playing almost immediately. The game is very simple and the rules are only two pages long, including excellent diagrams. What you actually have here is a memory game with a big old dose of randomness and a bit of "screw you" thrown in, and while I was playing it I never really felt like I was playing something designed by Knizia. On your turn, you roll the chunky dice, and then you move the number of spaces indicated. First you move around the base of the pyramid. On each space, there is a coloured crystal, and when you land on a space, you can take the crystal or you can secretly look in the adjacent secret temple and remember the colour of the crystal hidden inside. If you look in a secret temple, you then replace it on any empty space on the board. Once you have made a single complete circuit of the pyramid base, you start going up the side of the pyramid one step at a time. On each step on each side of the pyramid there is a crystal, and you can only stand on a step if you have a matching crystal or can reveal a crystal of the correct colour in one of the secret temples. If you cannot do either of these things, you are not allowed to advance up the pyramid and instead can move to one of the other three sides of the pyramid on the same layer; however, you still need a matching crystal, so you may be stuck not being able to do anything at all on your turn. As well as showing a number of pips, several of the faces on the dice also allow you to do other actions, such as rotating the pyramid or stealing crystals from other players. Two faces on the dice also allow you to move one mummy from the top of the pyramid down to the next layer, and then move all the other mummies that have already moved off the top. The mummies act as road blocks, as you are not allowed to stand on a step on the pyramid that contains one, forcing you to take a less direct route, or rotate the pyramid in order to complete your journey. It's all really straight forward and very workmanlike, and it just feels a bit like Knizia phoned this one in. Your fate is largely decided by the roll of the dice, as there is nothing you can do to mitigate bad dice rolls, or to prevent other players stealing your hard-won crystals. Worst of all, when you get to the top of the pyramid you have to roll the dice and roll a mummy face in order to win. That's right, this is a Knizia game in which the winner is determined by dice roll, with each roll having a 33% chance of winning. Not great. 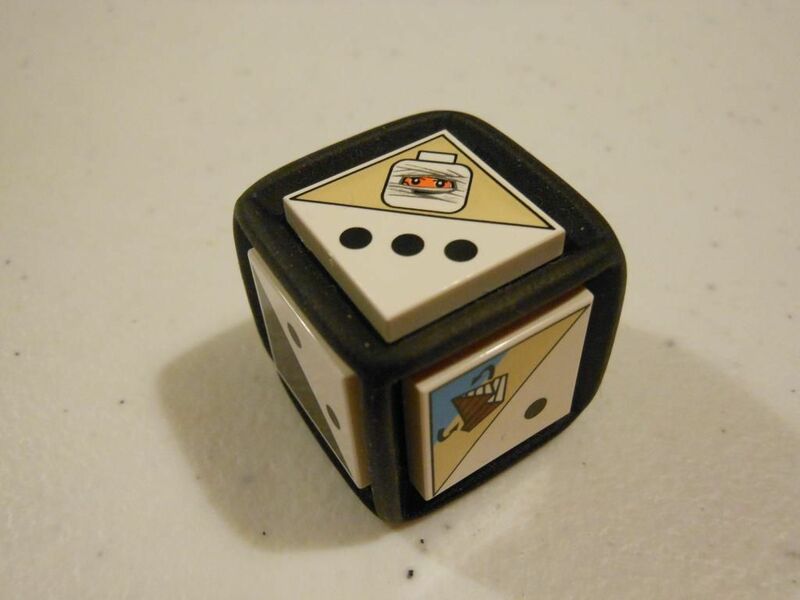 The dice - showing the face required to win the game. Overall, it's not a terrible game; I just felt a little disappointed that there wasn't a bit more to it. The Lego pieces are great, and the microfigs are cute; building the board was okay, and the game is solid enough for a quick play every now and again (particularly with younger players); but honestly, it should have been a bit better. Ramses on his pyramid... Nice hat! The only other thing worth mentioning is that the game encourages you to make up your own rules, and there is a page in the rulebook that makes some suggestions. 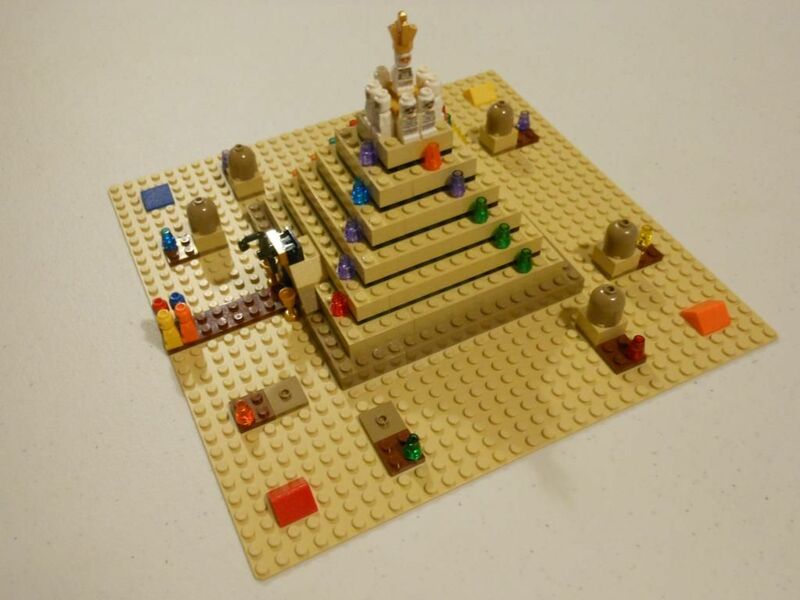 You could easily combine Ramses Pyramid with your Lego collection, or other Lego board games, to make something new. I'm just not interested in designing my own games - I want to play a well designed game, or play with some cool toys.